This is a request for action from those of you in Stillwater County. The County is in the process of updating its growth plan, last updated in 2007. They have done a poor job of soliciting input from the public, and the current draft of the plan is inadequate in many respects. I write about oil and gas issues, an area that has received little attention in the draft, so I am asking you to comment on that. COMMENTS ARE DUE NO LATER THAN THURSDAY, NOVEMBER 22, so please submit yours by then. Send by email to commission@stillwater.mt.gov. The Beartooth Front is a unique area that is vulnerable to oil and gas drilling. A failure to plan jeopardizes its long-term health. 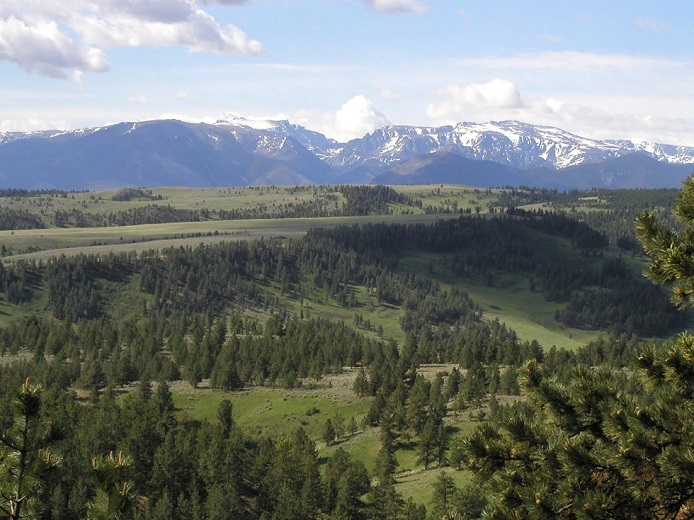 Growth planning is an essential element of county government in Montana. The comprehensive county growth plan was enshrined into law by the Legislature in 1999. While a growth plan does not have the force of law, it is an important document for shaping future policy. According to this law, the development of a growth plan is required to enact zoning. Unlike in 2007, the County Commissioners have not been proactive in soliciting public comment. As a result they have received very little feedback, and so we have a chance to influence the plan by having an outsied voice about issues that are important to us. You can view the 2018 draft growth plan by clicking here. The discussion regarding oil and gas development is mainly in Sections 4 and 5. Express concern about the impact of future oil and gas drilling and how it might impact areas in Stillwater County along the Beartooth Front in any or all of the following ways: incompatibility with agriculture, ranching, recreation, health, environment, or community. Speak about your personal concerns, and the need to develop regulations to ensure that drilling is done in a way that protects us. Please ask the commissioners to delete this paragraph. In the entire history of Stillwater County, there have been three citizen initiated zoning petitions — one in 1979, one in 1998, and one in 2015 (the Beartooth Front petition). This is not a trend, and it is appropriate for individual areas of the county to develop their own zones when they have unique needs. You may wish to comment on other areas of the plan. For your interest, here is a letter from local resident Burt Williams, who made wide ranging comments. Here’s some background on how the Stillwater County Commissioners have not taken public feedback seriously. In 2007 they did. 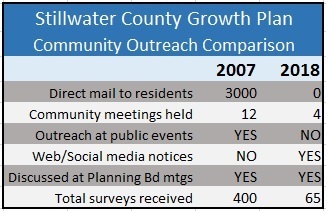 They sent direct mail surveys to over 3000 county residents, and they held 12 public meetings all over the county. County employees attended public events and handed out surveys, and there were notices published in local papers. Their efforts yielded broad public input. The meetings were well attended, and they received 400 surveys back, getting valuable input on the issues that were important to residents. That return represented about 5% of county residents, which, as any marketer will tell you, is a strong response. In 2018, there was no such earnest effort to solicit public input. Surveys were not mailed to residents, but were only placed online on the County’s web page. Notices were placed on organizational Facebook pages, but the social media outreach did not extend beyond organizational pages to social pages such as the Come Together Absarokee site, which has over 1700 members. There were only four community meetings — in Park City, Columbus, Reed Point, and Absarokee. This lackluster effort could not be classified as outreach at all. A web-only strategy with no direct personal notifications only reaches a small number of people. How many of you went to the Growth Plan page on the Stillwater County web site during the summer? I didn’t think so. The results were predictable. The County received only about 65 surveys from residents, a paltry return of less than 1% of residents. As an example, there were 22 survey responses from Nye in 2007; there were none in 2018. Why this batch of commissioners is uninterested in engaging with the public is beyond my speculation at this point, but planning in Stillwater County is going to suffer unless you take this opportunity to raise your voice. Neighboring Carbon County updated their growth plan in 2015, and their public outreach was a model for how residents can be engaged to develop a growth plan that serves the public rather than the county commissioners. The County began by soliciting public input through an extensive road show, holding half-day meetings all over the county. They made a video of public input and made it available. There were ongoing discussions at well-attended planning board meetings. Please write the Stillwater commissioners by November 22 to make sure they hear what we have to say about planning. This entry was posted in Uncategorized and tagged County Growth Plan, Stillwater County Commissioners. Bookmark the permalink. I am on the Planning Board that is overseeing this effort. I’m sorry that you are disappointed with the effort. Many of the decisions that were made were to keep costs down for an effort that seems, to many, to be a formality. I attended the Park City meeting to which fewer than a dozen people came out. However, comment can always be provided at the Planning Board meetings, which we have held monthly this year with few exceptions. Despite your concerns about outreach, it seems there is only one aspect with which you have issue in the Growth Plan, and I will be sure to reference this when we next meet to discuss the subject. Thanks for your interest on the subject. You may not be aware, there were also vacant seats on the Planning Board this year, and we love having passionate community members at the meetings. I have a number of issues with the document, but my blog is about oil and gas issues. This is 2018, and community members should not have to come to planning board meetings to give input. Take a look at the quality effort Carbon County made. The process generated real action that was important to community members. When you save money on community engagement, democracy suffers. I mentioned the planning board meetings because your blog stated “There were ongoing discussions at well-attended planning board meetings” so I wanted to remind folks that is still an option. I mentioned the planning board meetings because your blog stated “There were ongoing discussions at well-attended planning board meetings” regarding Carbon County’s process, so I wanted to remind folks that is still an option. Two members of our group took you up on this option last night. They both felt it was a waste of their time. Their input was not seriously considered, and the planning board indicated they had no charter to make changes in the growth policy. Very different from the situation in Carbon County, where there was active engagement with citizens.